Over a year ago I wrote a popular post called The First Three Minutes, which investigated just the first few minutes of a cold water swim. (A real cold water swim, not your balmy 10 degree Celsius getting a tan (50F) water for softies). We know, us cold water swimmers, that passers-by focus on the water and the time of year. They ask themselves and us, how could anyone possibly get into bitterly cold water in the depth of an Irish winter, without a wet-suit. It’s behaviour that borders on the insane to everyone else. It certainly is at best aberrant, definitely risky, beyond any conceivable reward. The tourists, passersby and pass-remarkers extrapolate from their own personal experience of cold on land or an occasional cold shower and from that they believe they can understand our world. Or at least believe that what we are doing is a sign that we are lacking in something. They cannot and will never comprehend why we do what we do and though I have explained why we swim in cold water, that explanation will only resonate with fellow cold water swimmers or similar adventurers. I had long thought that those first three minutes though were not the worst three minutes. Nor indeed was the worst time during swimming , afterdrop or when enduring the usual mild or moderate hypothermia that many of us endure on a regular basis. The worst three minutes occur at T-minus. That is, the worst part of cold water swimming happens before you swim, or at least, before I swim. It’s a cold mid-January Saturday. It’s lunchtime, past mid-day, late for a weekend swim. I didn’t sleep much of the previous night, I’ve been oscillating into and out of insomnia for months now and the previous night I got almost no sleep, finally drifting off only shortly before dawn, and stumbling awake after a couple of hours. The morning was the cold wet grey that is Ireland’s other natural colour. On such a dispiriting morning the lack of rest sapped my desire to get down to the coast but I eventually bestirred myself and arrived at the Newtown and Guillamene car park about 1 p.m., with the car thermometer reading 2.5 degrees Celsius. The bay at least was calm but that only meant that the light breeze was cross-offshore which meant cold. Combine that with the air and the ambient temperature felt about zero degrees. Wind chill is a stupid phrase. Winter swimming is stupid. Zero degrees. Grey skies, grey water, breeze, rain. 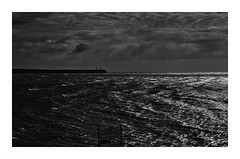 Out in the bay the big Dunmore East RNLI Trent-class lifeboat was steaming toward Powerstown Head, quartering the bay. Dunmore East is about 10 miles away, the local big fishing port. The reason the Elizabeth-and-Ronald (as an entirely charitable organisation which receives no government funds, RNLI boats are named after significant philanthropists) was in the bay was to search for the body of a poor lost soul, likely jumped from Powerstown Head across the bay, two days previously. (Thanks to David Dammerman for the camera! A friendly and generous gesture more appreciated than he maybe realises). Down on the concrete, the morning polar bear dippers had all left. Just myself, the breeze, the rain, the cold. Given the rain I put the box in the single occupant alcove which I only use in these circumstances. I took my thermometer out of the box and stood there and looked out. 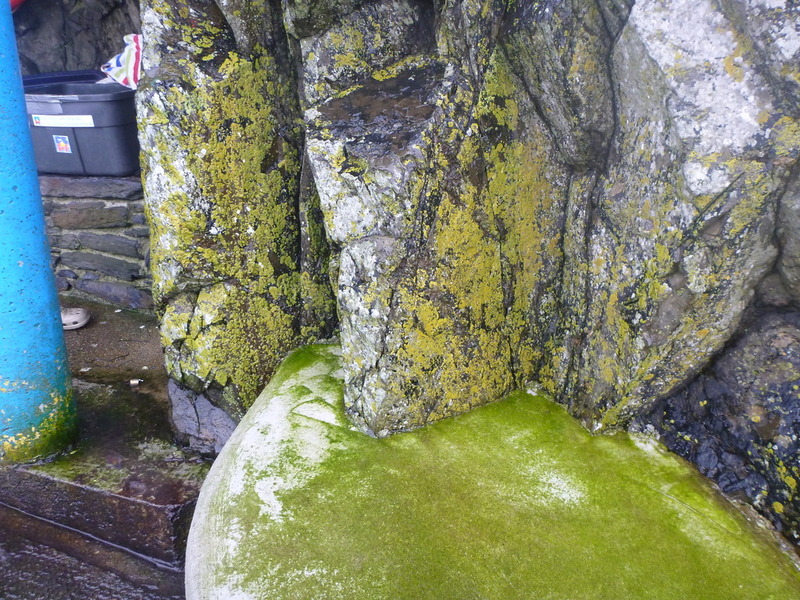 Rain dropped off the rocks into which the alcove is hewn, the yellow-green algae and lichen everywhere seeming almost to glow in the wet conditions. The alcove, the box, the rock, the rain, the algae. Clad in my heavy winter coat I gingerly went down the steps to the water’s edge, the algae on the steps having reached a dangerously lethal slippiness since last week. The tide was almost out, so all the steps were exposed down to the final ladder. Spring tide, over five metres range between high tide and low tide. Zero degrees. Grey skies, grey water, breeze, rain, low tide. Such was the surface underfoot that I had to use the stainless steel railings on either side. The steel was colder than ice-cubes and utterly necessary. By the time I’d measured the water (7.4 degrees Celsius, ~ 45 F., up three-quarters of a degree since the previous weekend but the combined air and water temperature was colder) and made it back to the alcove, my hands were painfully cold. Zero degrees. 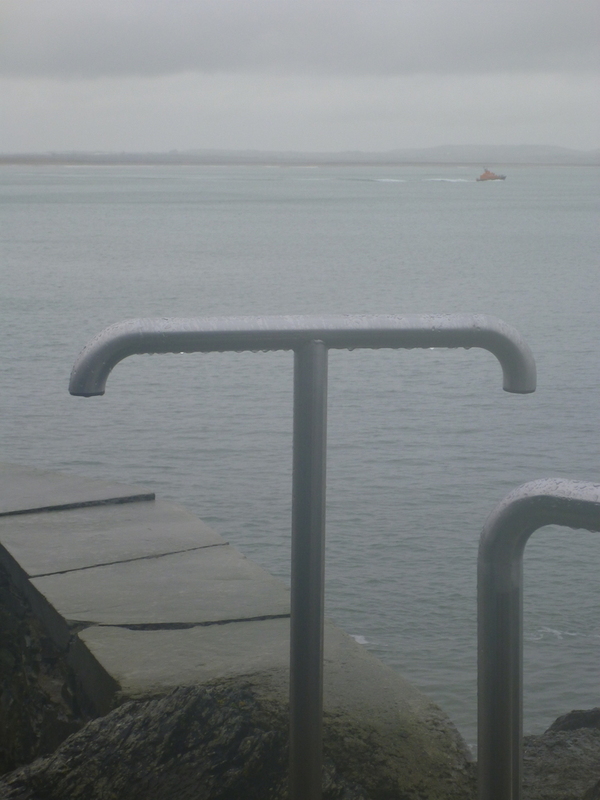 Grey skies, grey water, breeze, rain, low tide, cold water, tired. No-one around for a quick chat or hello. A lifeboat in the bay looking for the body of another likely victim of the recession in Ireland. Grim. I started to get undressed, pulled my freezing cold and wet togs over my bare luminous white arse, there being no-one around to require the towel-dance. Togs on, coat still on, I stopped. I just … stopped. I stood there. In the alcove, my feet getting cold, my hands sore even before I was ready. So tired that I knew the cold would hurt more than usual. It wasn’t the first time. There have been other days, other winters like this. Every winter has days like this. If it happens, this is the worst three minutes. All you have to do either swim or go home. Nothing will happen if you go home. The world won’t end. Except, you tell yourself, or I tell myself, maybe this will be the first crack. Fail to get in the water once for no good reason, and maybe the next time it’ll be easier to not get in. Worse, next time, maybe it’ll be easier to stay at home. Maybe not getting in the water means it’ll be all over for me. Maybe I’ll lose the thing keeping me going. I stood there, and there was no epiphany. 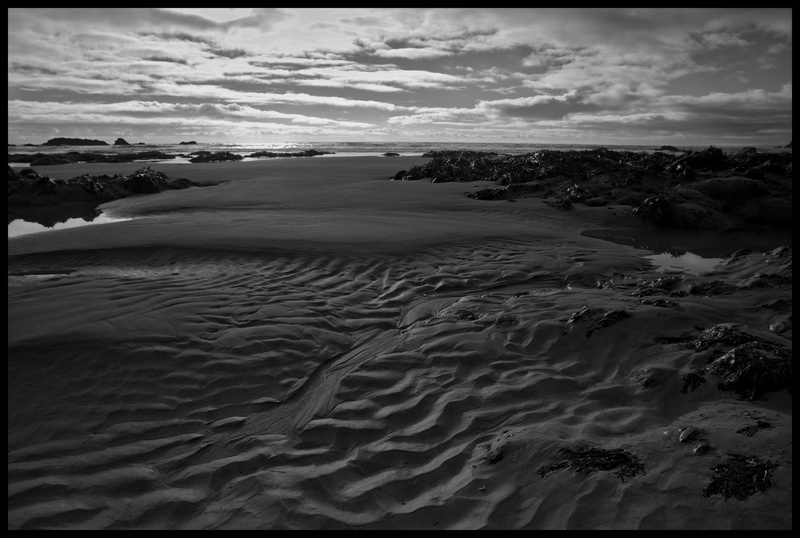 It remained desolate, cold, wet and grey. No lesson about anything here. I imagined I looked grey because I felt grey. Pathetic fallacy writ large. Nothing new for an open water swimmer. Nothing to see here. And then I finished getting ready and I got in the water and I swam. And afterwards I went home. They think cold water is tough? They don’t really know what’s the hard part. The worst part. And this week there was no Reverie. There was just paying the price of entrance, paying now for some warmer swim later or some other cold swim, swimming in the bay watching the lifeboats searching for another soul lost at sea, similar to me. And like all entry fees, there’s a single person supplement. A lone swimmer supplement. A temporary sandbar appears at lowest Spring tide beyond the rocks at Benvoy. Maybe I am the only person who ever walked on it. I walked around the edge so not to leave even footprints. As usual a great post! You inspire so many of us West Coast of Scotland swimmers – partly because we share with you very similar swimming conditions. Yesterday we had the dreaded horizontal rain and grey sea. But today we have a wee bit of blue sky, racing clouds, big waves and a high tide! Yippee – in I go! Thanks Lottie. Always good to speak to someone who knows about horizontal rain and The Grey. Have fun! This blog and the replies have almost brought tears to my eyes, of relief and of joy. I have been fretting over doing an ocean swim next weekend and the slippery slope of not doing it is looming large in my mind. I’ve done the swim once before but I’m a bit frightened of the surf at the other end (not the cold, it won’t be cold). And the distance. Your blog and the replies give me courage that, like you, I do just have to keep doing it, just not stop, not this time, not just because I’m 73. I don’t want it to be this year I start not doing it. Thank you all. Thanks Sue, I’m glad it was helpful to you. The trick with surf is go under it when you are swimming into it from the front. When coming at it from behind, try to keep your arms straight down as it catches you, which will help you body surf it. Best of luck. I agree entirely, the worst few minutes is never the swimming part. If I have all day to get my swim done, it is the hours it takes to gather enough resolve to get out of bed and do it. I always wake too early, its 5am. I always tell myself to get the swim over and done by 10 am, but find I am still in bed at noon, fretting about it. Then I get wet. Then freezing. Then an hour or so later I am warm and cosy and entirely and completely happy. I resolve to start the swim earlier next time, and always fail. Gosh Haydn you are my twin!! I fret about my swim all day instead of just getting it done and dusted and feeling fab afterwards for hours. I am a swimmer, but I am not a cold water swimmer. Maybe it is because I don’t deal with the cold water that I find your writings so interesting. I am curious, do you ever think about the dangers that are involved? Do you calculate the risks every time you swim? Thanks for your excellent blog– I am a big fan of your photographs. Thanks and the answer is both yes and no. Do you calculate the risks every time you sit in to drive a car? No, but you are aware that it’s potentially dangerous. One drives regularly based on experience and knowledge. In that way my swimming by myself is similar. On the other hand sometimes I know or can see that the situation has more potential for danger. In the case of swimming by myself, that is most likely to be tidal (I never forget the big tides here), weather, or location related or the unknown X. I can evaluate most things, and trust my experience and knowledge but none of us can foresee the unknown X by its nature. I do believe that because I swim by myself, I am more careful yet have an unwarranted minor reputation for being reckless, but also as a consequence of swimming by myself, I often feel okay about swimming in circumstances where others wouldn’t. Overall, I take each day on balance, and there are days I haven’t swum but because I felt the risks were too much. I’m working hard on the photography, I guess my readers all by the nature of the blog, like the same things as myself. In many countries “cold water” can be 18° ( I think that your case ) . LoneSwimmer means very cold water! ( 5°- 16°) As I know swim in the winter in the south Mediterranean sea is not danger. Very well written as always, especially the point about wimping out – will it be the first step on a slippery downward slope? In 6 years I have never wimped out at the water’s edge, though I have allowed myself a “rest day” about once a week. I note you say that 10 degrees is for “softies”, which, compared to you I certainly am. But it still takes grit and determination to keep going for six winters in grim, unpleasant, conditions and no-one who sees me go in ever says “softie”. They usually say “you’re brave”, “you’re mad” or “is it cold?”. But never “you’re a softie”. Thanks for a great blog, keep them coming. Thanks Iona, I have to admit to being somewhat tongue in cheek and faux-macho when I said deliberately made the 10 C comment. I did it mainly to rile up the swimmers who think 16C is cold, or worse, the pool swimmers who complain that a 28 C pool is cold for their morning training. For those people I have no pity! I however do occasionally get called a softie by a certain Sandycove swimmer friend who can easily outlast me in cold. Although the water I swim in (and it is summer in South Africa) is 24 C plus I experience this type of thoughts when it is windy or cold outside. I do not allow myself to negotiate about will I swim or not. I just do it. Luckily the swim is so rewarding every time that I am looking forward to the next one. The same might not be true for this extremely cold water. I enjoy your stories and your blog- please do not stop swimming in the cold water- it give you fascinating stories to tell us- your eager readers.